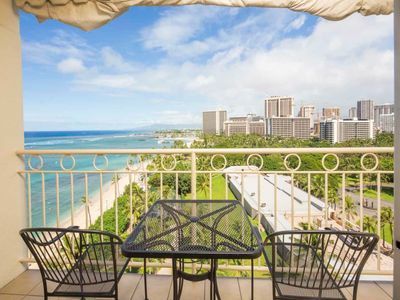 Experience paradise with an incredible ocean view Waikiki Banyan condo suite. 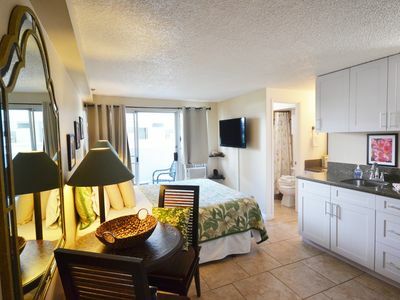 3014-2 is a corner condo with stainless steel kitchen appliances and tile throughout the entire unit. 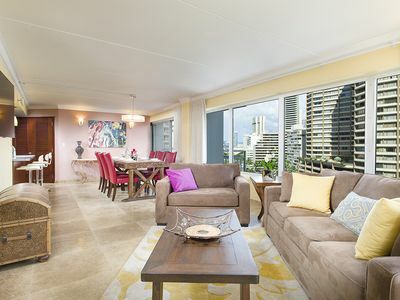 Corner units are larger than other Waikiki Banyan units; this suite has larger living and dining areas for your enjoyment. 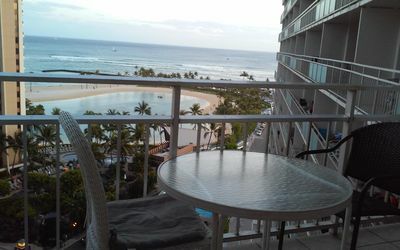 Plus, it is only one block from world famous Waikiki Beach! Tiled throughout - clean and sanitary. 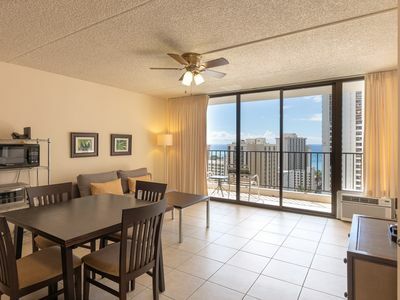 The kitchen has a spectacular view of Diamond Head Crater and the Ocean. 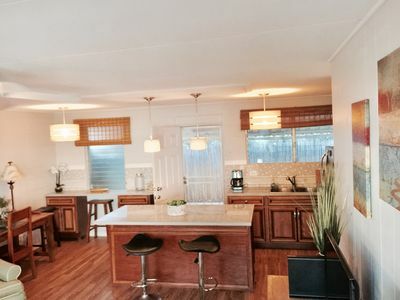 Enjoy a fully-equipped kitchen and comfortable seating in the living room. Kitchen includes refrigerator, range, microwave, rice maker, coffee maker, and other kitchen wares. There is a wood table which seats four people. 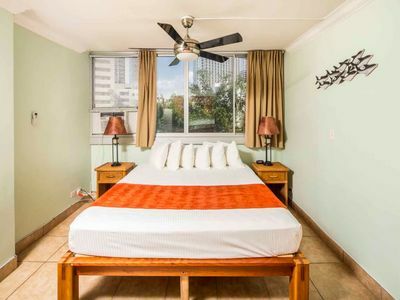 Sleeping arrangements include a queen bed in the bedroom. If additional sleeping capacity is needed, there are high-quality air mattresses available for rent. The bathroom has modern cabinetry and counter tops. There is a door between the vanity and the toilet for added privacy. 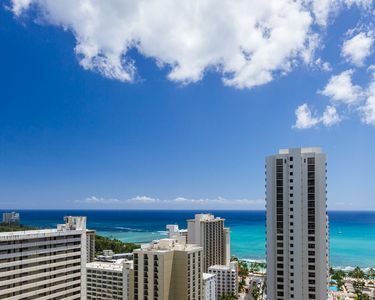 Take advantage of one of Waikiki's best values. Book today! FREE covered parking, FREE WiFi internet and FREE local and toll free phone calling. If you use the bus, the stop is right next to the building. 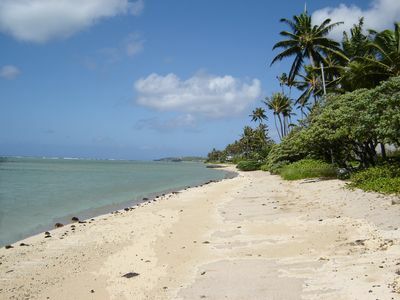 Take advantage of all of the extras we provide so you can get the most out of your vacation. 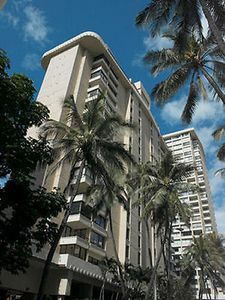 Koko Resorts at The Waikiki Banyan is the perfect location for your honeymoon, anniversary, or to just relax and enjoy paradise! 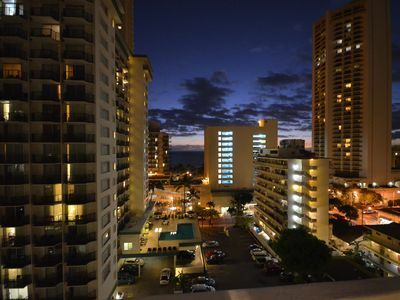 Located only one block from world famous Waikiki Beach, The Waikiki Banyan is conveniently located near a wide selection of restaurants, specialty shops, and other tourist attractions. 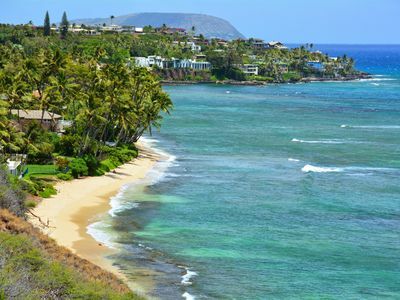 The kids will love the Waikiki Zoo and Aquarium which are located only a few blocks away. 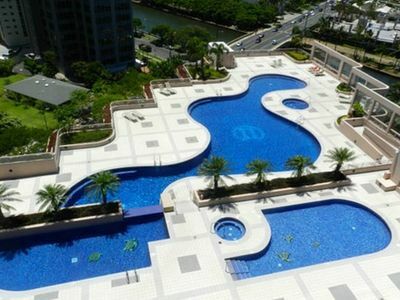 Koko Resorts saves you money with standard amenities including FREE parking for one vehicle, FREE WiFi internet, and FREE local and toll free phone calling. In addition, all suites managed by Koko Resorts include a full size kitchen which will save you money and help you eat more healthy by not eating out for every meal. Please note the actual bedding configuration prior to booking to ensure the proper bedding for your stay. 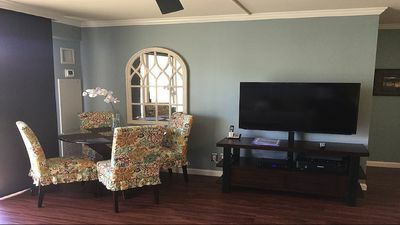 Maximum occupancy or the number indicted that a suite sleeps may not always be the same as the number of guests that a suite can sleep in a traditional bed. Portable (folding) cribs and high quality inflatable mattresses are available for rent at $10 per night upon advanced request. For your convenience, Koko Resorts provides laundry detergent under the bathroom sink and coin operated laundry machines are available on every floor. Upon 24 hours or more advance notice, in-unit towel exchanges are available at $15 per exchange and tidy clean maid service is available at $35 per service. 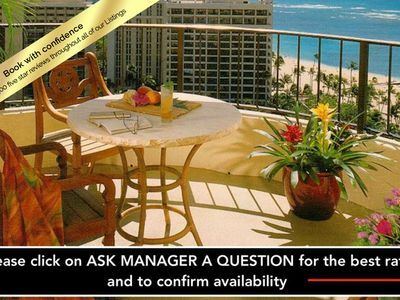 In case of the unexpected, Koko Resorts offers 24 hour emergency guest assistance just a phone call away. 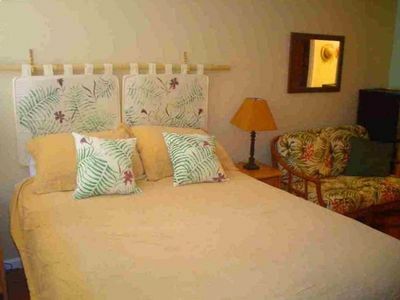 *15% discount on stays during 4/17-6/14* Hale Niuiki - Beautiful home with a private pool! 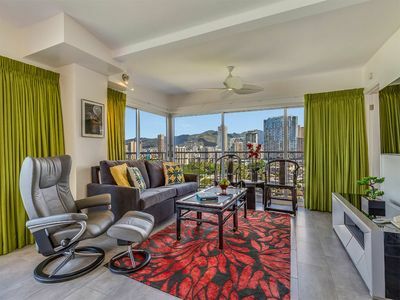 Beautifully Remodeled 2 Bedroom Waikiki Condo - Sleeps 6! 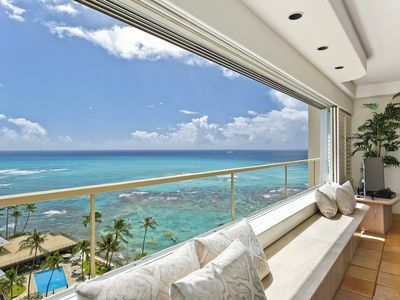 Ocean and Diamond Head views from this Beachfront Vacation Rental!